Bagby Hot Springs - Let's work together to make Bagby Hot Springs Better! The hot springs area has two main hot springs that feed three bathhouses. There is also a historic cabin with shed, a FS guard Cabin with shed, and two outhouses . There are no services available, but many people are known to drink the cold water from the cold water spigots at the big round tubs, as it comes from a spring up in the woods. The main bathhouse is named the “Private Deck” because there are five hollowed log tubs each in there own rooms with a half roof to let you soak in the weather and yet also keep your clothes dry! There are often lines of people waiting for their own private room. The wait can be avoided if you are willing to soak with others on the next deck. Right beyond the Private Deck is what is called the “Public Deck”, Open Deck, or Lower Deck. This has the remaining three hollowed log tubs salvaged from five in the original bathhouse that burned and was torn down by the Forest Service in 1979. There is also a big soaking tub that comfortably fits 8 people, but has been know to hold 16! The custom to soaking on the Public Deck is communal soaking… please respect this and invite others to join you! About 100 yards South of the main bathhouse is what is called the “Upper Deck”. This was the first deck built by the Friends of Bagby after the original Bathhouse burned. It was meant as a place to clean up and soak together as the new bathhouse was built. It is a deck and round soaking tub, just like the above mentioned one on the Public Deck, capable of holding 8 comfortably, but known to hold many more! This is not a private deck, it is meant to be communal, so please invite others to join your group. If there is no room for others to join you it is polite to limit you soak to about 1-2 hours so as not to monopolize a tub. For hundreds of years the hot springs were free and open to all. In 1998 the Forest Service began charging “parking fees” as part of the Recreational Fee Demonstration Program. In May 2002 the FS banned alcohol as well. Please visit www.freeourforests.org for more information on the government “demonstrating” that the public is willing to pay fees to access public land. 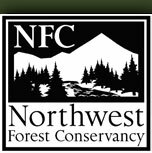 Northwest Forest Conservancy (NFC) is a Federal 501c3 non-profit organization. Copyright © 2009 Austin Preservation. All rights reserved.